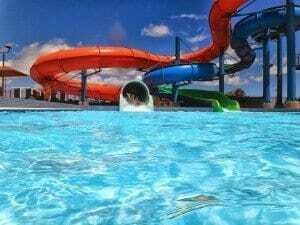 Welcome to the largest waterpark in the entire state of Arkansas, the Wild River Country water park. This 26-acre splash zone was opened in 1985 and serves the dedicated public every weather appropriate day between Memorial Day and Labor Day. Within the grounds of this magnificent park your group will find 13 attractions, several water slides and pools, party decks, pavilions, cabanas, and a full volleyball court! This is the perfect place in North Little Rock to really let loose, relax, and have some good ole’ fashioned fun in the sun! Within the park be sure to check out some of the most popular rides and attractions such as the Thrilling 3, Vertigo, Pipeline,Accelerator, Sidewinder, and the largest raft ride in the state, the Cyclone. There is also the always fun Wild River Rapids, wave pool, tad pool, and Ol’ Swimmin Hole. For a racing thrill try out the Black and White Lightning racers! Once you’ve worked up an appetite you can stop at concessions for anything from cheesy pizza, to juicy burgers, to fresh squeezed lemonade. For any forgotten water gear or day-away souvenirs be sure to stop at the park gift shop, and also be sure to check if there are any of the several seasonal events, festivals, or performances happening that day before you go!